I've confirmed this news from earlier this month as well as I can: it seems the attempt to merge independent media stations in the Netherlands did not succeed after all. While this issue may come back to haunt us another time, at least for the moment, Omrop Fryslân is remaining independent. "Omrop Fryslân and the other regional broadcasters are remaining independent initially. The planned merger is not proceeding. State Secretary Sander Dekker decided that today. There is too much resistance from the participating media organizations according to Dekker. Eight of the thirteen regional broadcasters opposed the new restructuring. 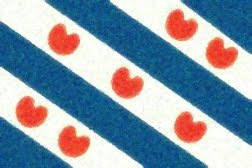 Omrop Fryslân was one of those eight." Tige tank! Thank you so much for your kind words and for taking the time to comment! If you began your studies through the University of Groningen online program, personally, I was very pleased with their Frisian course. I think they're currently the best way to start learning the language. Súkses!